Wah! I'm trying to devote the day to figuring out this home Singer serger so that I can quickly make baby burp cloths, but it's not happening...and I actually have to read the directions! A fellow Ralph Lauren Mista came over last night to help me figure out how to thread the darn thing, and we broke at 10pm to eat chedder burgers at the Dive Bar. She slept over, since she lives in Brooklyn and the hour subway ride home was a horrible thought, so we woke up, got chocolate crossaints, coffee, I made eggs, and we tried to run the serger again. The above is a culmination of our work. Now I'm reading the manual. Gawd. 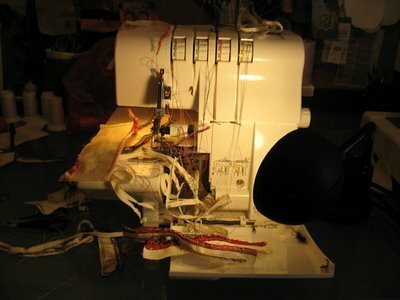 The work of two weeks ago, this "new" singer sewing maching for school use suddenly powered down (it's plugged in), so that sucked. 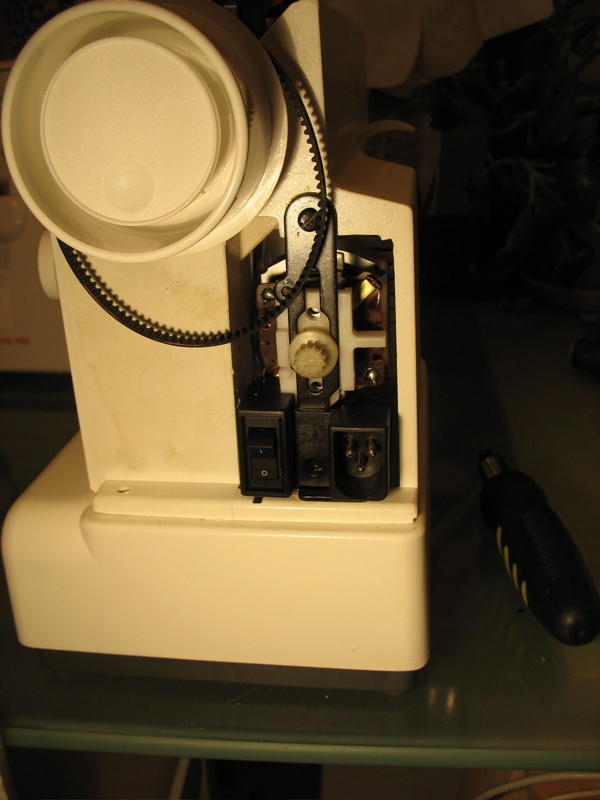 I took it apart to reveal what you see here, unscrewed the motor, and ran the needle. All ran fine, so I buttoned it back up, and the hand wheel kept skipping that belt you see pictured. Aaah! Days later, I realized that the motor slides up and down the black metal shaft there, and I had screwed it in too high. I lowered it, and all seems to be running normally...I have yet to run a baby burp cloth through it.